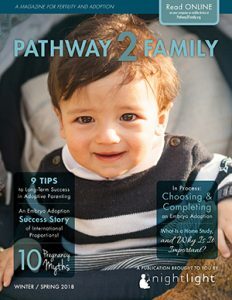 This is a brochure that may be useful to you for learning more about Embryo Adoption. Please fill out the form below to gain access to download the PDF version of the brochure(s) to your computer. You may make as many copies as you would like. Learn how you can realize your dream of pregnancy and give birth to your adopted child through embryo donation and adoption. Discover answers to several frequently asked questions that can help you if you're just beginning to consider embryo adoption.